Work is nearly complete on the next Bald Explorer episode, Taking the Waters; a documentary about the discovery of the spring water at Tunbridge Wells, in Kent. However, there are still a few things to make it complete and hopefully assist the telling of the story. When filming, particularly on a limited budget, it isn’t always possible to match the same production values as the big boys. The BBC love to take their presenters into museum archives and have them presenting pieces to camera while at the same time handling original texts, books and scrolls. It is as if they need to demonstrate visually that what they are telling the audience is factually true. To be honest, I do wonder how many people would know whether the so-called 17th century manuscript written on vellum and scrawled in ink by a quill pen is genuine, or that it is the book in question or even if it proclaims the things we are being told. We have to take all this on face value – but they do love to show you this type of thing, so you can ‘believe’ it is authentic. I am afraid, I do have to cheat a little here. Whilst I try to give an as honest account as possible, I cannot pretend to be a leading authority on any subject, nor do I have the money to access the genuine original materials – but I am not really sure that I need to in order to tell the same story convincingly. However, cheating is really only there to help the message be understood. For example, in the first picture, (above) you will see me sitting in my kitchen with a few samples of what looks like chalybeate water. Chalybeate is actually crystal clear if taken from source, but it does contain quite a large amount of iron, which leaves an orange tinge in the glass. I filmed watered down Ironbru to colour the water slightly. I wanted to distinguish it from tap water and I am hopeful that using this commercial product it would even contain an element of iron! Secondly, my kitchen is old fashioned, and no science lab – so to give it the feel of authenticity and help paint the picture of an old Victorian chemist’s lab, I added in post production a couple of period medical posters. Yes, they were not there when we filmed, but adding them afterwards gives the impression of a laboratory without me actually saying I am in one. Dramatic licence at work here, I think. 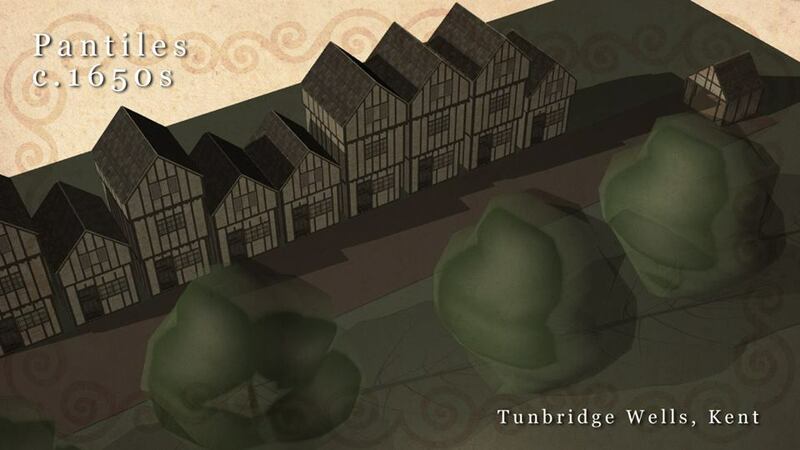 I also used a little computer graphics to create imagery of the original Pantiles and source of the spring water. We know from historical text it was surrounded by a shed and small fence and we are told a number of timber framed properties were built in close proximity before the current constructions were erected. I haven’t found any reference material for these early buildings so I have made an educated guess and the short animation is merely there to illustrate the descriptions. The main aim of all this deceit, if one wants to call it that, is really to engage with the viewer, encourage people to either read further about the subject or visit the spring waters for themselves and make up their own minds. The programme will be broadcast in the new year on the Community Channel. I make these programmes for free and as yet I do not gain an income from them. If you would like to help get these episodes produced and get to view the finished documentary before its first transmission, then please visit the website and make a small donation. You can find the Payal button on the right hand side. Thank you very much.